Last night was such an exciting moment for the U23 Viet Nam national football team after beating U23 Malaysia, U23 Thai Land and U20 Japan. 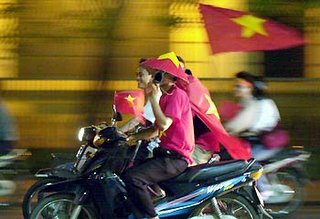 Heaps of Vietnamese celebrated and rode their bikes around the streets, shouting "Vietnam Vietnam". 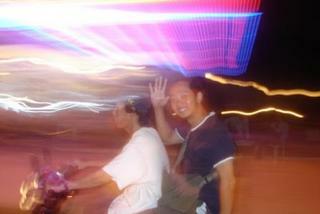 I also was riding my motorbike wander around Hanoi to share the happiness with my countrymen. What a fantastic preparation for the Sea Games which is going to be held in December in The Phillippines. 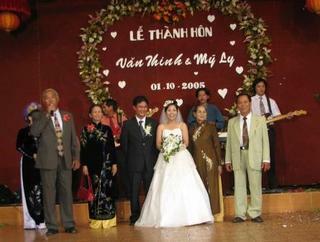 The Vietnamese team won $40,000 for their victory. 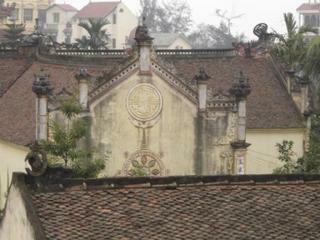 The artful mixture of colors and houses in Hanoi makes this place so beautiful. 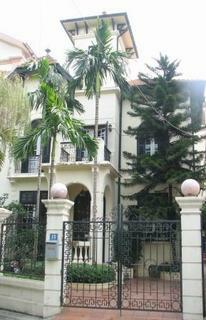 French colonial and art-deco architecture with mostly yellow paint are the most impressive. The long tube houses in Hanoi may make you surprised about how it is possible to live in such tiny holes but that's the way it is in Viet Nam because we say, " Land is Gold". 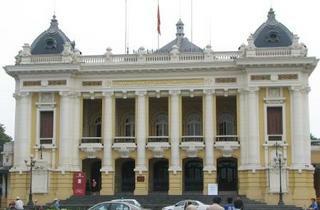 In addition, you can see some big Soviet-style buildings such as the Hanoi railway station and the post office. Many of the pagodas and temples have been influenced by Chinese architecture. Some rich Hanoians who live around West Lake in nice big villas. This is a really quiet area but very expensive and secure. 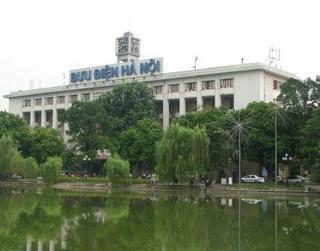 In Hanoi, the basic house consists of the first floor, which is a welcome room, the second floor has bed and bathrooms and the drying room for hanging the clothes is on the top. However, do not be surprised if you see Vietnamese people hanging clothes in front of their houses or on the electric lines. My body is both white and round. In water I may sink or swim. But I still shall keep my true-red heart. 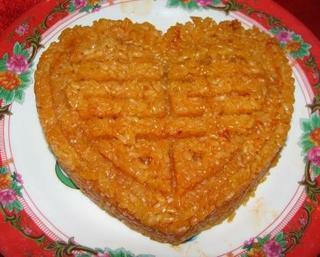 This is one of the most famous desserts or sweet cakes in Hanoi which is perfect for those who love sweets. It is a winter sweet and we actually call it Chè or Bánh Trôi Tàu. 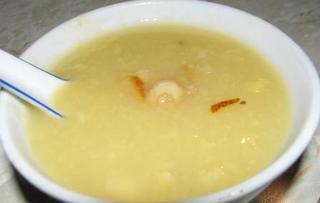 The round dessert is made from rice flour with sliced coconut and green bean in the middle. 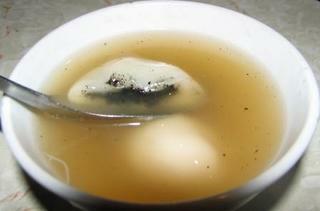 Another kind is similar but with black sesame paste cooked and covered in a syrup of tapioca stock. Luc Tau Xa is made from green bean, lotus seed and some slice of mandarine peel, this is a bit sweeter than other but still very yummy. 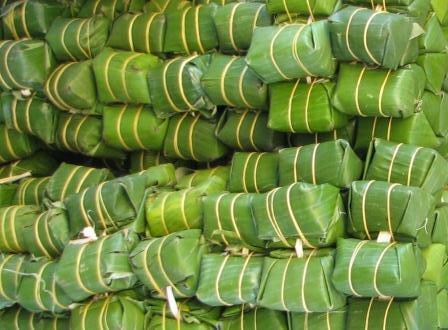 Go to Hàng Giầy and try Trôi Tàu Cake at Phạm Bằng's shop between 3.30Pm and 10.30Pm. It is delicious. House problems? No worries, just wander around the Thien Quang Lake, or Hang Bong street and you'll see lots of men with some tools and tools boxes on their bicycles, ready to help you. Another area where they wait for odd jobs is Buoi street near the Daewoo Hotel. There is a big group of them there minus bicycles. 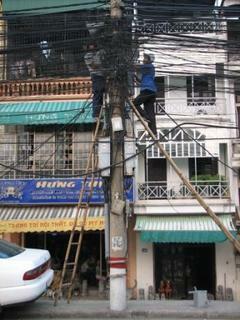 They are Hanoi's handy men. Most of them are from the countryside around Hanoi and they came to the city hoping to earn more money than where they were. But life in the big city is not what they thought, and they will do any kind of odd job that they can to help their family. Bargaining is a game in some cases but you have to be strong enough to get the real price with these guys, which can range from 20,000Vnd up to 200,000Vnd depending on what you want done. Who Wants To Be A Dong Millionaire? 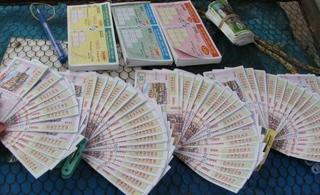 Why don't you take a chance to be a millionaire by buying a 5000Vnd lottery ticket? 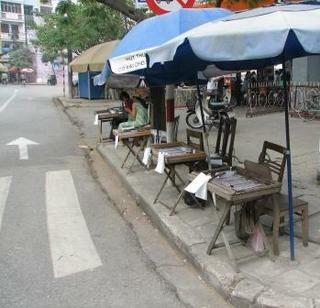 Some streets are lined with lottery ticket sellers at little desks waiting for customers on motorbikes. Other sellers wander the streets with a handful of tickets. There is another black lottery ticket called So Đe which is not run by the goverment and is therefore illegal. The most common conversation in coffee shops and amongst Xe ôm drivers is lottery lucky numbers and lottery results. Gambling is an increasing problem in Viet Nam, that's one of the reasons why many people have lost their homes and families. If you do try your luck, make sure you don't get addicted. Hopefully you will be the lucky one! 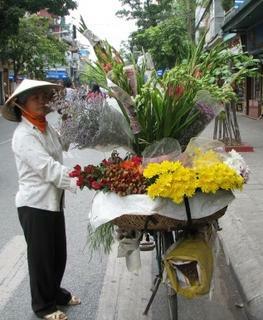 The travelling florist is my story today. This is a really hard business not because of the physical work but because of the long hours involved. These flower sellers have go to the flower market to buy flowers between 12 Am and 4 Am then return home to arrange them for sale. They start selling at around 6 Am till they've sold out. 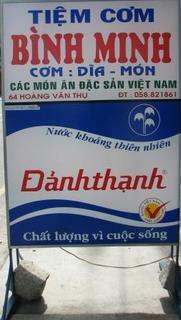 Their income for a long day is about 40,000Vnd. 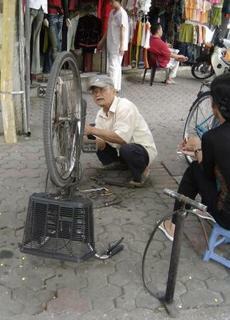 An old man sits on the pavement with a pump and a bottle of petrol, signs that this handy man will fix your motorbike. It's 500 dong for a wheel to be pumped up and 5000 dong for fixing a hole. How much do you think they earn per day? Sometimes, they get desperate. There is a big problem now on the high way to the airport, on Thang Long Bridge, where lots of pins were spread all over the road. Quite a few people had accidents because they couldn't control the motorbike, when they hit the pins. It seems that they don't really care that someone may get killed by their chasing small income, what are they thinking? 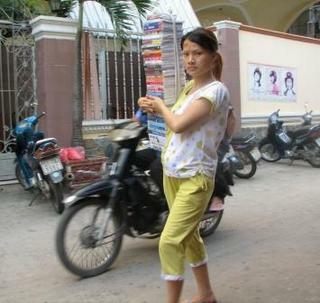 A warm welcome to Nha Trang is a smiling local face, seen easily on the hot, lazy streets. They will try to speak to you as much as possible, if they have the chance. Do not be surprised if they ask you, on first meeting, about your age and personal details. These simple English questions are what they've studied at school. 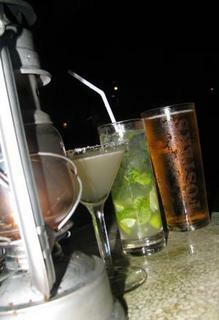 There are lots of highlights in Nha Trang: culture, food, architecture and nightlife highlights. 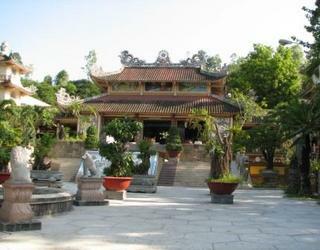 The white pagoda is a huge, peaceful place to come and relax and listen to the chanting of the Buddhists. Nha Trang people love to go to the pagoda on every first and fifteenth lunar day, and at the end of the month. 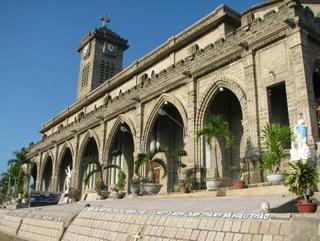 There are heaps of churches in Nha Trang, most of which are really old. Lots of people choose the Rock church to pray at because it's great looking, really old and right on the top of the hill with nice city views. If you want to try some Vietnamese food for lunch, don't forget this address which has really good food and is not very expensive. The sour "Nem Chua" is one of the most famous dishes in Nha Trang. 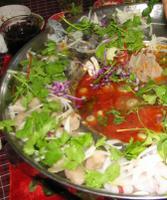 You have to take off layers of leaves and eat the centre meat with some sweet chilli sauce, just a yummy dish. Having coffee at the Phu Sy cafe is a nice experience. 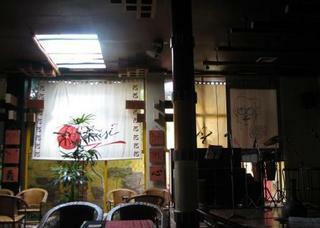 It has a nice atmosphere with great coffee. They do live shows in the middle of every week, all kinds of different performances. 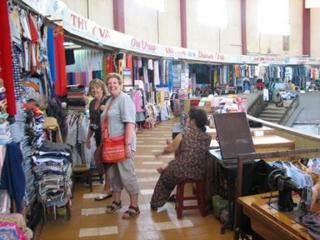 The biggest market in town, the Dam market is a most popular place for locals to come and do business. You should take a short walk around and have a good look. 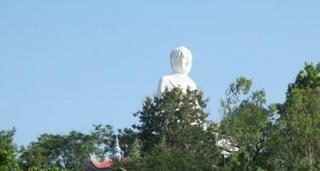 Hon Chong- Roch mountain is such a magic place with links to a legend about the fairy. Go and hear the people who live around there talking about it. 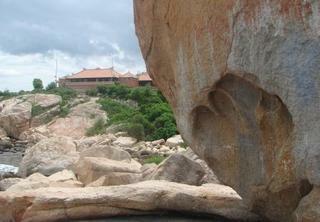 Don't forget to place your palm on the rock, like in the picture. Relaxing at the mud and hot stream baths is a good, healthy afternoon activity. It might boil your bum off but it's fun. 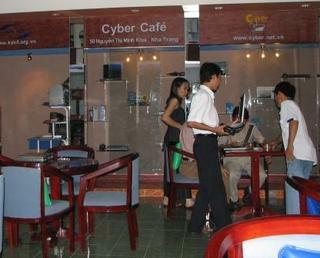 Checking and sending email to friends at Cyber net in Nguyen Thi Minh Khai St is very comfy and hi-tech. 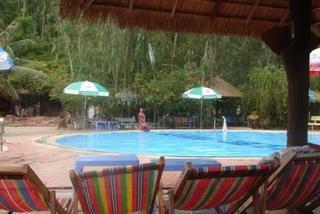 You can use fully equipped lap tops in an air conditioned area. 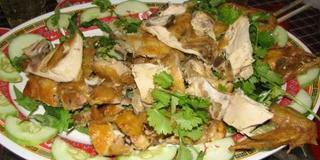 A dinner at Hai Vy is a good place with delicious food and good, fast service. All of the seafood is so fresh and the prices can't be beaten. End your day at the Sailing club where you can meet people for a chat in a good atmosphere right on the beach with cold beer, great cocktails and the best DJ in town. 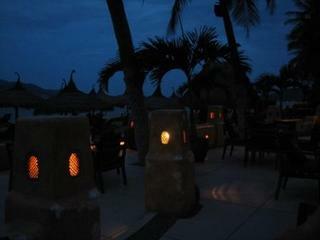 Hope you guys have a nice time if you ever have the chance to come to Nha Trang. And of course, this post can't give you all the information but you can check out the lonely planet or click the following links: Nha Trang1 , Nha Trang2, Nha Trang3. The Viet Nam Open is the first ever fully-fledged ATP tournament for tennis in Viet Nam, and it was a shame that no Vietnamese player got through to the second round. 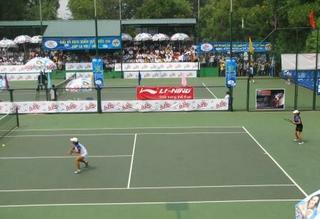 Even though they lost, I am sure that they learnt a lot from the top professional tennis players who competed. 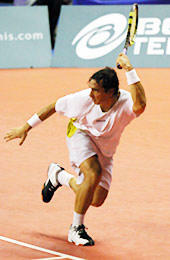 The ATP officals said we did well in organising the tournament, despite some small mistakes. For a first-ever time, it was quite impressive. The Vietnam sport news said that "old father Bjorkman" won the title with experience and great shot-making against the youth and strength of Stepanek. This is the first time that Vietnamese fans have been able to see their favorites player from around the world and they were so excited. 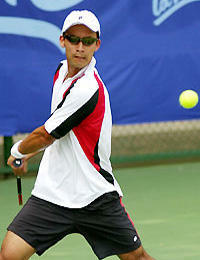 In addition, the Vietnamese national tennis competition has just been held, finishing on the 16th of October. I was so disappointed in the standard of umpiring and the behaviour of the Hanoian fans, who are very one-eyed. Ngô Việt Hà, a young tennis player who has trained in Russia and Spain, seemed to not know how to behave fairly or professionally. She constantly distracted her opponent by stalling for time after every point. It was so bad and the umpire did not have the guts to do anything about it. The crowd was so horrible, the way they shouted, used mobile phones, spoke very loudly and walked around the stands during play. There was no respect here in such a very important tournament. No wonder that the quality of the matches was poor because the players couldn't concentrate. 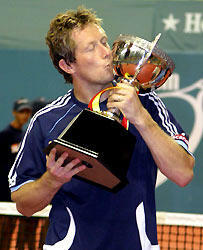 Anyway, the best players won the cups to finish what officials said was a successful tournament. 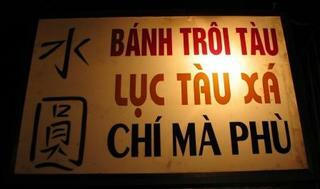 I think Vietnamese fans need to understand that tennis is a sport with a certain etiquette. It's still new for us. Ly is my good friend who got married recently, Thinh is her husband who has been with her for over 9 years. Thao, Lien, Tuyet and me are so glad that we were here to share Ly's happiness. 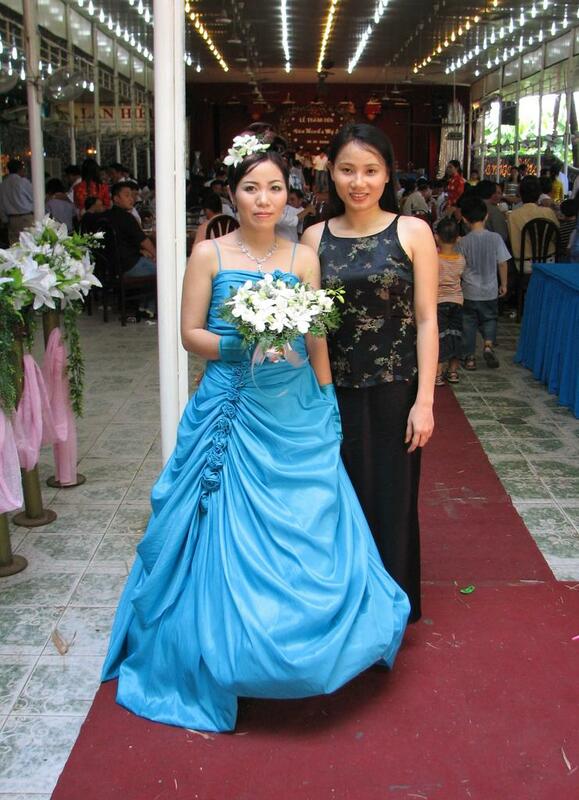 She celebrated her wedding in a big restaurant near the river on the highway in Nha Trang, a place with very professional staff and delicious food. We had steamed prawns with garlic and chilli in beer, a duo of roasted chicken with stickyrice, rolled stir fried beef with asian herbs and rice paper, a Thai hot pot and steamed momordica glutinous rice. Fresh fruit for dessert, soft drinks and Saigon beer were provided for everyone, as much as you possibly could drink til you drop. She looked so happy with Thinh that day. 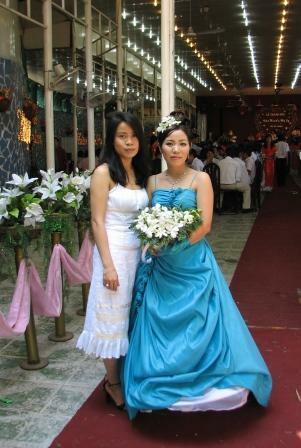 They have been living near each other in Ninh Hoa and both families have their own seafood restaurants which are very successful. He has just opened his own seafood restaurant in Daklak - in the central highlands and she will move up there for her new life. If you ever go to Nha Trang and head to the wild beautiful beach called Doc Let, you will see on the right hand side her family restaurant called Gio, which means Wind, or you can try her sister's restaurant which goes by the same name, at 86 Tran Phu street in the city. 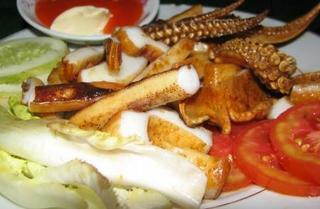 Great fresh seafood! 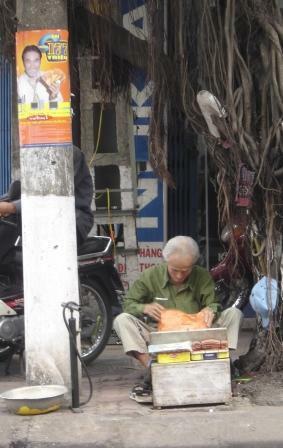 Hanoi sees lots of people selling newspapers and lottery tickets everywhere, around coffee shops, restaurants and markets. Their announcement would be like: "Báo mới, báo mới đây"- "New news paper here", and sometimes they record their own voice on the tape and simply play it over and over. Occasionally, they give some hot news which belongs the magazine to attract the readers. This is an easy job, if you like walking, but is not well-paid. 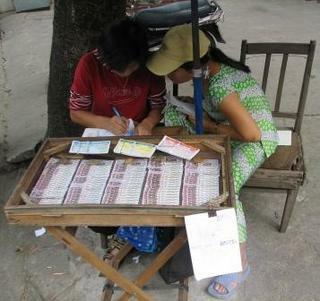 They earn from 20,000 to 50,000Vnd per day depending on the weather, how much hot news there is that day and the lucky numbers they have on their tickets. Lots of older people try to do this job instead of selling flowers or fruit which is better financially. Electrician have such dangerous and risky job and they lose their lives sometimes. Lots of electricians do their job without using safety equipment. 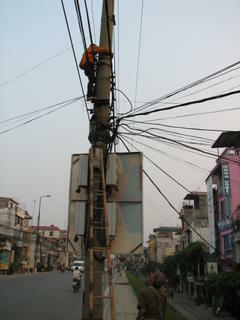 There are thousands of fatal work place accidents every year in Viet Nam. 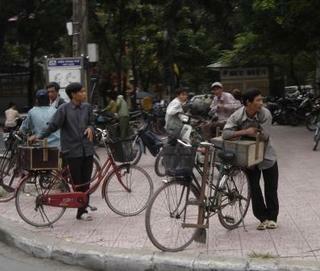 No wonder when you see situations like those in these photograph all over Hanoi.